Tearing paper is something that some of us paper crafters tend to avoid doing. Some of us want to make our projects as perfect as possible and despair over a misplaced score line, an uneven meeting of edges, paper cut too short or too thin. It can be so refreshing and stress relieving to think about actually ripping your project instead! Lol! I'm talking about a controlled ripping here. What you are aiming for is an interesting, uneven edge for your layers. First, choose the paper you want to use as a layer. If you choose double sided paper, make sure the side you want to show on your project is facing you. Some people use a water dipped paint brush or an aqua pen to draw along the edge they want to tear before ripping it. This can help to make the edges a little straighter or controlled. Sometimes I use a tearing ruler to rip along the edges of longer pieces of paper, such as a 12" x 12" scrapbook page. These rulers already have an interesting and uneven edge and using them as a guide for your ripping action can create a wonderfully designed effect. 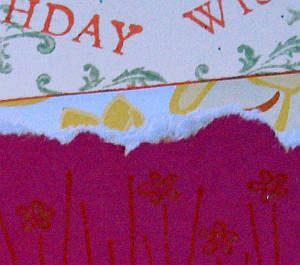 I left the torn edges of my layers white in the handmade greeting card shown above but you can ink them in a similar or different colour. This is known as a distressing technique. Something else you can do once the white layer is exposed is to sponge or ink it in a colour that contrasts or compliments your project. Or curl the thin edges with a wooden skewer or paper piercing tool shaft. You can make your paper look quite old and worn by continuing to work the edges this way. Try using torn-edged layers to make your 3-d paper flowers sometimes, too. 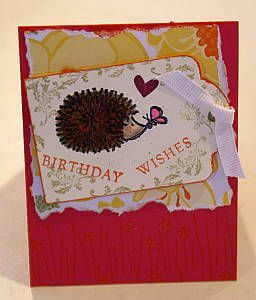 You can add many layers of torn paper to a project for a textured and free-form effect. Sometimes I tear all the way around a stamped image instead of cutting it out neatly. I made a torn paper mat for my crayon resist card. Torn paper is great to use as a mask when you want a ragged inked edge on a project, such as in this reflections card. Are you ready to try it? Go release some stress and start tearing paper, or ripping some paper purposefully today! Lol! If you liked this technique, you might like to try stamping with bleach or CASEing a card next.